The guinea pig, also known as the cavy, is a friendly rodent and a popular cage-dwelling pet. Despite his name, the guinea pig does not hail from New Guinea or any other Guinea, nor is he a pig; he makes piglike noises and he likes to eat, though. Guinea pigs are endemic to the Andes mountain range of South America. Sizewise, the adult guinea pig is larger than a hamster or a rat but smaller than most rabbit species. The gestation period of guinea pigs is between 60 and 70 days. Once guinea pig pups are born, they stay near their mother constantly for both warmth and food, nursing for up to 30 days. Males are ready to reproduce at around the age of 3 weeks, so pups must be separated by gender before this time. Guinea pigs are weaned between the ages of 3 weeks to 4 weeks and will begin to eat grass and hay, then pellets. 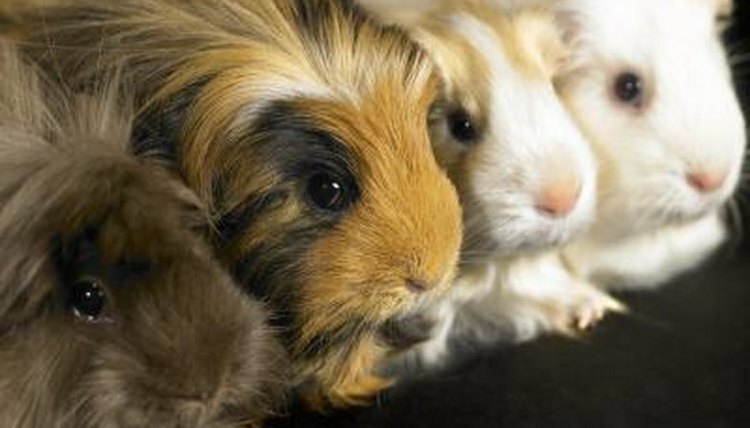 Sociable guinea pigs will not bite or scratch unless frightened or provoked; they are among the more docile rodents. Groups of young guinea pigs will develop male-dominated hierarchies; watch for harmful aggressive tendencies in your pigs. Missing fur, bite and scratch marks, injuries and fearfulness are all signs that the males should be separated. Generally speaking, it's best to have one neutered male in a group of females when keeping guinea pigs as pets. Adult guinea pigs are quite vocal; a female with young will chatter and click to comfort them, happy guinea pigs will "bubble" and purr, and stressed out pigs will rumble. Never pick up a rumbling guinea pig, as the tendency to bite in that moment will be high. Excited guinea pigs will also "wheek", an onomatopoetic word for the sound guinea pigs make in anticipation of something; typically food or play. Wheeking is a mix of squealing and whistling, and is most common in the mornings and early evenings. The average guinea pig's lives between 5 years and 7 years. Like you, a guinea pig tends to suffer from ailments associated with old age, such as arthritis and cataracts. A common issue for elderly guinea pigs is dry skin, which you can combat by adding a little safflower or soybean oil to their food. If your guinea pig is suffering from illness and is unlikely to return to a healthy quality of life, you may have to consider the possibility of vet-assisted euthanasia. While it's sad to lose a furry friend, keeping yours from pain is often be more kind. Talk with your vet about your options.